3M 218 Fine Line masking tape is great for paint striping. This tape stretches for smooth curves and tears easily. Not for extended outdoor use of more than one day. Finest color separation available. Paint sharp, precise lines with clean edges. Resists sticking to or pulling up new paint. 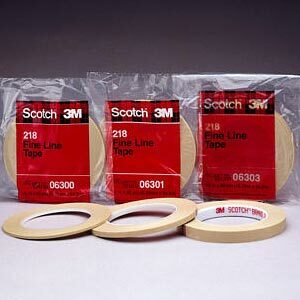 3M 218 Fine Line tape is moisture and solvent resistant. It reduces paint buildup on edges. 218 pulls up clean; leaves no residue. This tape is used by professional teak installers as a bond break liner underneath teak deck caulking with polysulfide caulk beads. Using a bond breaker compensates for expansion and contraction between wood and caulk.